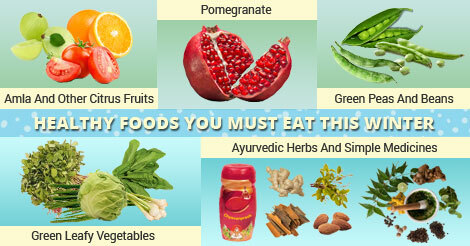 Winters provide an amazing opportunity to boost your health and immune system by offering a wide range of superfoods. While there are numerous winter season foods available, here is the list of 5 most empowering foods you must have during winters. Amla and citrus fruits like oranges, lemon, and tomatoes are found in abundance during winters. All these fruits are full of vitamin C which is a natural immunity booster. These fruits are also full of vitamin D, vitamin K and potassium and thus are very helpful in making bones stronger and regularize hormonal imbalance. Greens like spinach, methi, cabbage, and spring onions contains ample amount of vitamin A and thus are very beneficial for eye health. These low-calorie foods contain vitamin K which improves bone density and reduces the risk of osteoporosis. The seeds of pomegranate contain an antioxidant called anthocyanins. This antioxidant has been proved to significantly reduce the risk of prostate cancer and cardiovascular diseases. Regular consumption of pomegranate also improves hair and skin health due to its free radical scavenging property. Green peas and legumes like fava bean, papadi beans, green chana, and green tuvar falli are only available during winters. Peas and these legumes have phytonutrient named coumestrol which is a proven anti-stomach cancer nutrient. Research also suggest that regular consumption of these foods reduces the risk of type 2 diabetes in persons with strong hereditary. These legumes also contain a significant amount of omega-3 fatty acids, vitamin E and beta-carotene. According to Ayurveda, winters are the best season to boost immunity and resolve underlying but unrecognizable ailments by consumption of some basic Ayurvedic remedies. Ayurveda emphasis on the intake of ginger, tulsi, cinnamon, cardamom, dry methi, almonds, and gund (edible gum) during this season. Chyavanprash is the best Ayurvedic combination of important herbs and must be consumed with milk in winter.